Meltwater lake near Helheim Glacier, Southeast Greenland. It’s that season once again when year-end attention turns to the frigid Far North. Tales of a toy workshop at the top of the world mix with thoughts of possible Arctic cold fronts bringing snow. This year, the season comes soon after a flurry of recent studies and reports about the profoundly disruptive impacts that global warming is bringing to the Arctic ecosystem and neighboring regions. Here’s a partial summary, which can serve as a guide for further reading about how the Arctic is “going through the most unprecedented transition in human history,” thanks to manmade climate change. The Arctic Report Card, an annual report sponsored by the National Oceanic and Atmospheric Administration, documented various ways “that the warming trend transforming the Arctic persisted in 2017,” including the second warmest air temperatures ever recorded and the lowest winter sea-ice coverage on record. Warming in the Arctic is occurring at about twice the rate of the rest of the planet, the report said. “The Arctic is going through the most unprecedented transition in human history, and we need better observations to understand and predict how these changes will affect everyone, not just the people of the north,” Jeremy Mattis, director of NOAA’s Arctic Research Program, said when the report was released on Dec. 12. Air temperatures: Over land, the average was the second-highest on record, after 2016 – 2.9 degrees F (1.6 C) above the 1981-2010 average. Over seas, temperatures were up to 7.2 degrees F (4 C) above average, adding to delayed autumn “freeze-up” in some regions. Sea ice: Maximum coverage (in December) was the smallest on record, while minimum coverage (in September) was the eighth-lowest. Each year, sea ice is also getting thinner, with more relatively young ice. Older, thicker ice made up just over a fifth of the ice cover this year. In 1985, it was 45 percent. The Arctic Report Card, documenting “rapid and dramatic changes,” presents “a powerful argument for why we need long-term sustained Arctic observations to support the decisions that we will need to make to improve the economic well-being for Arctic communities, national security, environmental health and food security,” Timothy Gallaudet, the acting NOAA administrator and a retired Navy rear admiral, said upon the report’s release. Gallaudet is a Trump administration appointee. Six days after he led the Arctic report’s release, the administration dropped climate change from the National Security Strategy’s list of the things it recognizes as global threats. The steep plunge of the blue trend line on the sea-ice part of the chart represents “the largest magnitude decline in sea ice, and the greatest sustained rate in sea ice decline in that 1,500-year record,” Emily Osborne, a scientist who assembled the chart data at NOAA, told Vox. Melting of sea ice adds to overall global warming as it reveals darker, more heat-absorbent ocean waters. But as Vox noted, it doesn’t contribute to rising sea levels. 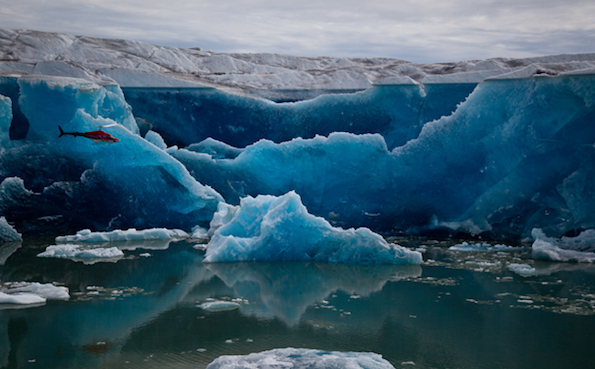 Something that does contribute to sea-level rise is melting from Greenland’s massive ice sheet. A day after the release of the Arctic Report Card, the journal Science Advances published a new study documenting an “abrupt shift” in runoff from Greenland to the ocean. This discovery establishes “the first observation-based connection between ice sheet runoff and climate change,” they wrote. Vox published a detailed report on the Greenland study. 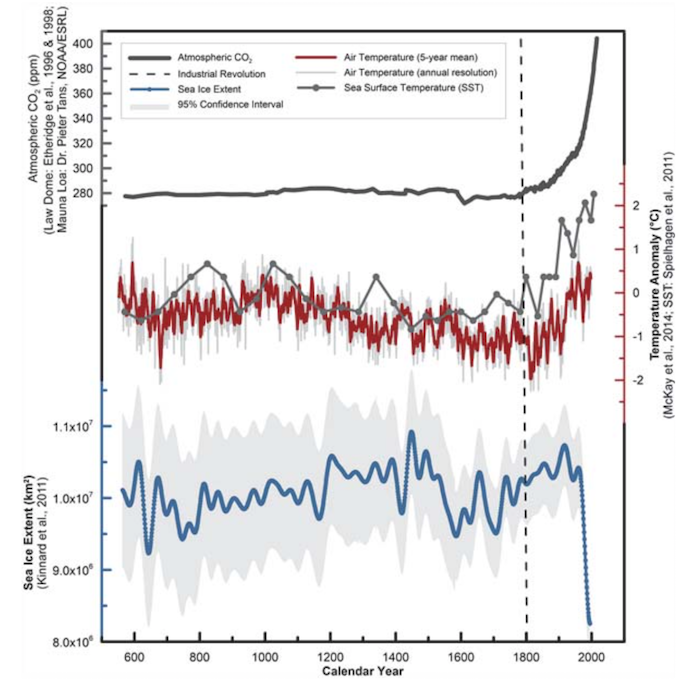 Worries about abrupt and calamitous melting of the ice sheet are not new. A year ago, for example, scientists reported in the journal Nature that they had discovered that the Greenland ice sheet practically disappeared for an extended period in approximately the past million years. “The finding casts doubt on assumptions that Greenland has been relatively stable during the recent geological past, and implies that global warming could tip it into decline more precipitously than previously thought,” Columbia University reported at the time of the study’s publication. “Greenland contains about 684,000 cubic miles of ice – enough to raise global sea levels about 24 feet if it were to melt completely,” the university’s announcement noted. Since 2000, the report said, permafrost temperature increases have been greatest in the “cold [continuously frozen] permafrost” of the Alaskan Arctic, Canadian high Arctic and Norway’s Svalbard archipelago stretching from that country’s mainland to the North Pole. Both the New York Times and Vox examined permafrost problems resulting from climate change in recent articles. Once this ancient organic material [frozen in permafrost] thaws, microbes convert some of it to carbon dioxide and methane, which can flow into the atmosphere and cause even more warming. Scientists have estimated that the process of permafrost thawing could contribute as much as 1.7 degrees Fahrenheit to global warming over the next several centuries, independent of what society does to reduce emissions from burning fossil fuels and other activities. [Permafrost melting means] things are getting weird and creepy: The ground warps, folds, and caves. Roadways built on top of permafrost have becoming wavy roller coasters through the tundra. Long-dormant microbes — some trapped in the ice for tens of thousands of years — are beginning to wake up, releasing equally ancient C02, and could potentially come to infect humans with deadly diseases. The Arctic Report Card reported that “recent long-term changes in permafrost temperature are driven mostly by the surface air temperature trends,” with other key factors like snow cover, vegetation and soil moisture not yet manifesting long-term trends at the regional level. Image credits: Photo – Henrik Egede Lassen / Alpha Film via Arctic Council’s Arctic Monitoring and Assessment Programme. Chart – NOAA.